Nom Cat v2.0 is out! The left button is the button for a new game mode: Turbo! Click it and you'll see the word TURBO appear. This game mode is for the Nom Cat experts! Are you ready for even faster fish and bombs?! Here's a tip: get good at this game mode, because there's some really awesome stuff you can unlock by getting a high score! Yup, there's 5 beautiful new backgrounds to choose from! You can get into the background selection through the button on the right. You can unlock all of these with goldfish except for the space background. This one you have to get with a high score in Turbo mode. Trust us, it's really worth it! Finally! You can select 2 different cats to play with. It's very easy: pick the one you want on the left and then pick the one you want on the right. You can also use the random button to let the game choose cats. Note: since you can pick 2 cats now, we split up Venus/Roo and Oskar/Klaus. If you purchased these cats before, the seperate cats are unlocked automatically! The late Colonel Meow is in Nom Cat. He was an extraordinary cat with an amazing fur, check him out on Facebook! A cat from Slamdovia enters the ring: Wrassling Cat! Phew, that's quite some features, huh? Play Grumpy Cat®, Nyan Cat® and Keyboard Cat®! What are you waiting for? Download the update! Hello everyone! Nom Cat came out last week and what a wild ride the release week it has been! I've been meaning to write a blog post about Nom Cat earlier, but we've just been too busy working on the game. If you didn't notice already, Nom Cat was featured on the App Store front page! Tons of people loved the game and we have an average of 4.7/5 stars with over 5000 ratings and reviews! Thanks for your support! Nom Cat started off as one of those games where we thought to ourselves: let's make a simple and fun game in just 2 weeks! Of course that wasn't true in the end. We added a lot of things and even coped with delays! In the beginning, Nom Cat was a just sketchy cat that eats fish and dodges bombs. We quickly started fleshing out the game, we added a background and gold fish that could be used as currency to unlock new cats. But Nom Cat couldn't stay as sketchy as it was. We experimented with a few designs and we ended up with a grumpy looking cat, which we thought was the funniest and most iconic. We then started adding tons of new unlockable characters based on Nom Cat! The rules of the game quickly changed too. 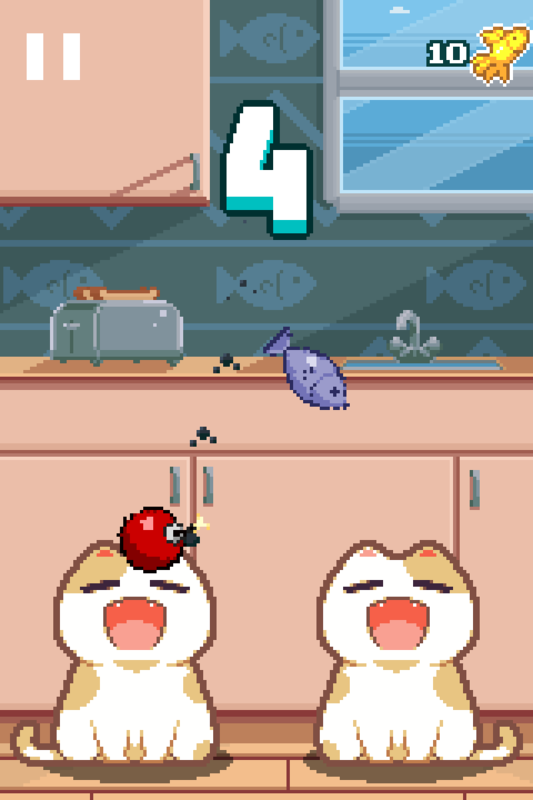 We added 2 cats in the game which made catching fish and dodging bombs incredibly frantic. You were allowed to miss a few fish in the beginning. We removed this rule later, because we felt the game should have a more "Flappy Bird-like" experience. Make one mistake and you're out! The thrill of catching every fish was much bigger without a life line! Many people are asking us: can you add Grumpy Cat? Or Lil Bub? Pusheen? We'd love to add all the famous cats from the internet, but of course this isn't just a matter of simply adding them to our game. All these cats have owners and we need to ask their permission! We are really happy we were able to get so many famous cats in. If you want to support these cats, purchase them for only a dollar! A part will also go to charity! 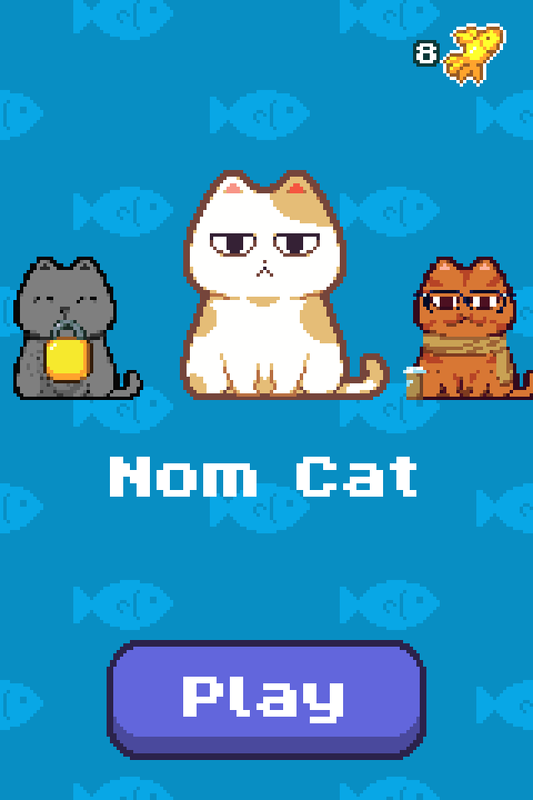 We're working hard on the next update for Nom Cat. I hope you're excited as we are. There's tons of new cats and improvements. See you next time! Hello everyone! Here at Lucky Kat Studios, we're working hard on our games. We're still editing Nom Cat here and there and we've started working a new game! We'll have plenty to show about this in the upcoming weeks. First, let's do a long overdue introduction of the Lucky Kat team! Growing up with NES and SNES games, Hernan has a passion for retro styled games and visuals. Apart from programming the games, he also does pixel art and animation! Check out the Momodora series for example, or our Mario-inspired Super Bunny World. Herdjie runs the business side of Lucky Kat Studios. He is also the founder of 8tea5, the best bubble tea franchise in the Netherlands and Belgium. If you ever decide to visit The Hague, go check out the 8tea5 store! Jasper is the young, talented pixel artist in our team. His current ambition is defeating everyone at ping pong at the office. Before Lucky Kat Studios, Jasper worked on a really cool game called Penarium. Go check it out! The newest addition to the team is Li Dong. She will focus on marketing in Asian countries! Whenever she's not busy on Weibo or working on her thesis, she takes care of her chickens and her cat. Hello everyone! This is Hernan. It's been several years since I founded Hei Games, a mobile game company where I released games developed by myself. It's a lot of fun, but doing everything on your own is a lot of work. That's why my brother, Herdjie, is now joining forces with me to form Lucky Kat Studios! 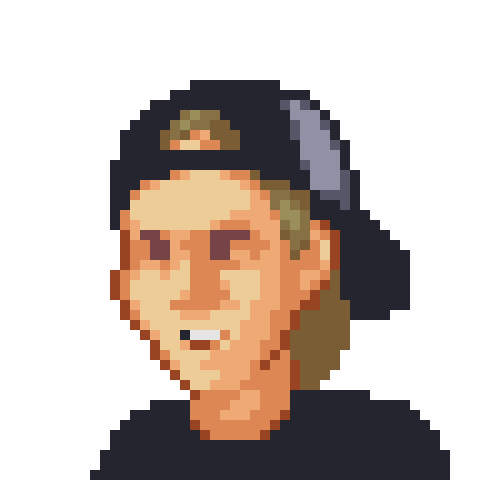 Not only that, we have the talented Jasper Boerstra working with us as pixel artist! We'll be making some awesome games together! We'll talk some more about the team in another blog post. First, let me show you what we're working on! 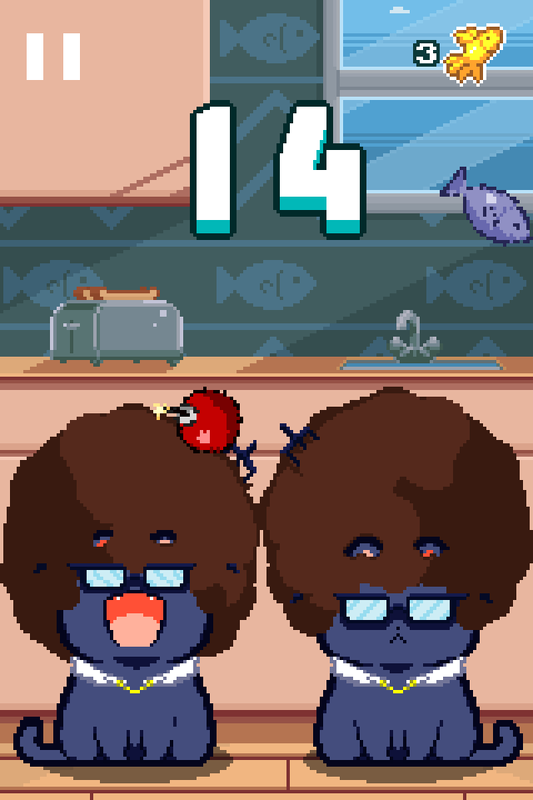 There's loads of funny and cute cats to unlock. What's even more exciting is that we have several awesome pixel artists we asked to draw some unlockable cats. I didn't really expect to get a lot of reactions, but it goes to show how awesome the indie game community is! More about this in another post. We'll have lots more to show! Right now we're beta testing the game, so if you're interested in that, drop us a message! Hope you look forward to Nom Cat!